I’m slowing sharing out a collection of student-created Interactive Fiction pieces, which I am compiling into a website resource, too. 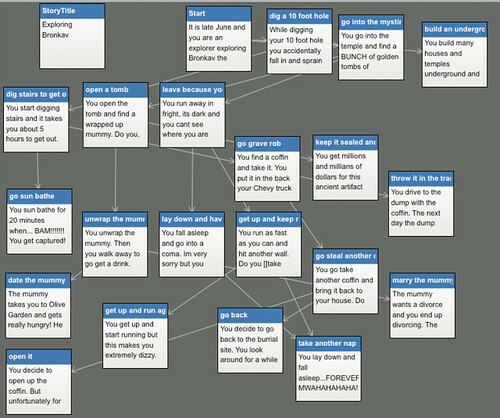 Here, a team of two students really got into the narrative choices as they worked with the software, Twine, to map out and create their story: Exploring Brankav (I believe the name is a play on elements of their names). Read Exploring Brankav by Brooke and Audrey. You can also read the story I posted the other day — The Temple of Selaina by Sarah.